This glorious novel (loosely based on a true person) takes place on New Year's Eve 1984, when the fiery and ever curious Lillian walks the length of Manhattan on the eve of her 85th or 86th birthday. She tends to lie about being born in 1899 and prefers a birth date of 1900. As she strides out this night, she encounters memories of her days as a highly paid ad executive at R.H. Macy's in the 1930s, a beloved job she had to leave when she became pregnant in 1942. She attends an artsy New Year's Eve party and, along the way, is confronted by muggers (with whom she strikes a bargain); comforts a nightwatchmen; and soothes a worried young bodega clerks. There is a new adventure and a heartfelt reminiscence at every turn. Rooney weaves the tale of her life with great candor and humor, and I loved being along for the stroll. “Extraordinary…hilarious…Elegantly written, Rooney creates a glorious paean to a distant literary life and time—and an unabashed celebration of human connections that bridge past and future. "Rooney's delectably theatrical fictionalization is laced with strands of tart poetry and emulates the dark sparkle of Dorothy Parker, Edna St. Vincent Millay, and Truman Capote. Effervescent with verve, wit, and heart, Rooney’s nimble novel celebrates insouciance, creativity, chance, and valor." KATHLEEN ROONEY is a founding editor of Rose Metal Press and a founding member of Poems While You Wait. She has been recognized as one of Newcity Lit's "Lit 50: Who Really Books in Chicago 2018." Her previous work includes poetry, fiction, and nonfiction, and has appeared in The New York Times Magazine, Allure, Salon, The Rumpus, The Nation, the Poetry Foundation website, and the Chicago Tribune. Kathleen was named "Best Novelist" by the Chicago Reader in 2017. She is married to the novelist Martin Seay. 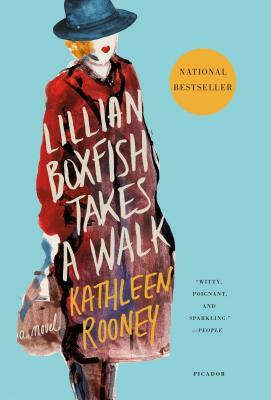 "Past and present intermingle in Rooney’s novel, distinguished by a careful shift from past to present tense but always unified by Lillian’s unfailingly witty, reflective voice." "A lively, fictionalized version of Fishback's story...[with] plenty of charm."